Wow! Today's stage 18 was amazing; just look at that profile, three HC climbs including a mountaintop finish at the top of the Col du Galibier. You could expect fireworks, and you would be right. Of course there would be a break, and of course the break would disintegrate on the climbs, with a few goats breaking clear, and the leaders staying together until the final climb, and then pow the attacks would come, right? Wrong! Instead there was a huge break of 24 riders, with the rest of the peloton staying together and midway through the second climb on the Col d'Izoard Andy Schleck attacked! and boom he was gone. Nobody knew what to do with him... none of the leaders responded, figuring his attack was too far out to succeed. The break blew up and riders kept going backward all day, and meanwhile Andy just kept going, ultimately fading a bit on the final climb but still hanging on to win. 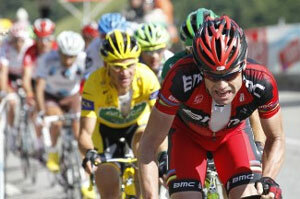 Cadel Evans drove the chase up the final climb, limiting his losses, and dragging Voeckler along to keep him barely in yellow. 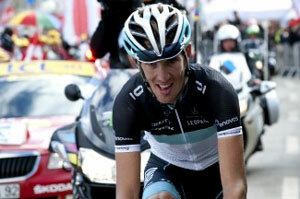 Others who hung in included Ivan Basso, Damiano Cunigo, and Franck Schleck, but Contador was dropped (!) and is now out of GC contention, as was Samuel Sanchez (!) What an amazing stage of an amazing tour. 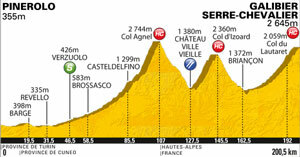 At this point we have only l'Alpe d'Huez ahead (wow!) and then the time trial (on my way there just now :) and then the final parade, so we can conclude that the winner will be Andy (0:15), Frank (1:08), or Evans (1:12), and Voeckler has a real chance at the podium. Only Cunigo (3:46) and Basso (3:46) are close enough to compete for third, at this point Contador (4:44), and Sanchez (5:20) can make the top five but not the podium. Stay tuned!